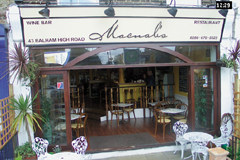 Macnab’s is truly Balham’s first restaurant/wine bar, established since 1987 and owned and managed by Nick who will give you a warm welcome. Come in for just a glass of wine, a beer from the wide selection on offer, a snack, brunch or select from the menu of dishes all carefully prepared using only daily fresh produce. Sunday roasts a speciality and on Saturday watch your favourite sports. Happy hour is 5-7pm when you receive a 20% discount off any alcohol purchased. Open every day from 11am-11pm (10pm Sunday). Our menu features modern British cuisine with all dishes carefully prepared using only fresh produce daily.